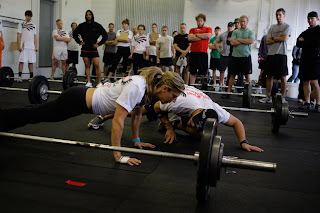 Carey and I teach the technique at The Fittest Games Challenge! First W.O.D 225lbs Dead lift x 10 Push Ups x 10 Pull ups x 15 reps. The Championship is on April 4th in Austin Texas. I am Crossfit. Jesse has transformed since the beginning of I Am Crossfit Challenge. Jesse played college soccer at St. Edwards University Austin Texas and was looking for a program after his soccer career ended. Jesse dropped 9lbs. and 5% body fat in 9 weeks following the zone diet and joining Crossfit Central classes. Pictured above is Jesse doing 225lbs. deadlift at The Fittest Games.